It’s an R month. Which to me, at least, means lots of oysters. Ordered a hundred over Christmas (they live a good ten days in the refrigerator, covered with a damp towel). At the end, when we’d had our fill of oysters on the half shell, I fried the last of them. 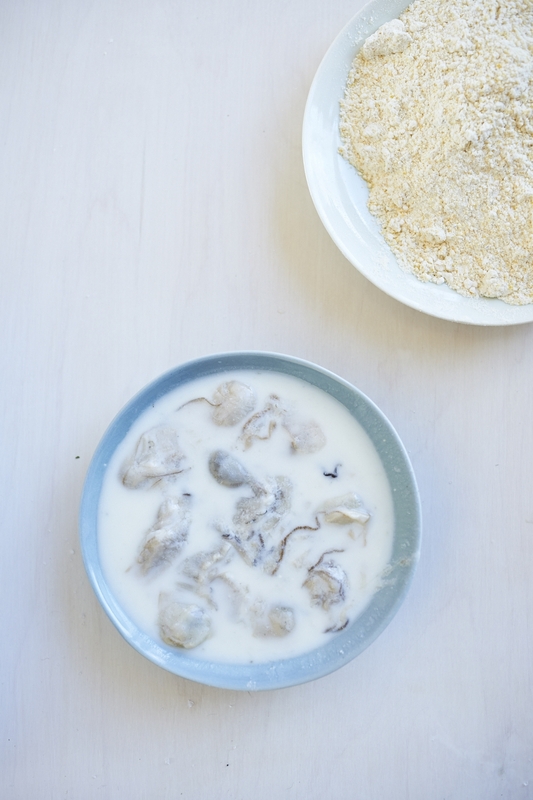 Carefully drain the oysters, and put them in 2 cups of buttermilk for about 10 minutes. Line a baking sheet with waxed paper or a silpat pad. Mix 2 cups of cornmeal with 2 cups of flour and a teaspoon of salt. Pick up each oyster, shake it a bit, allowing the buttermilk to drip off before plunking it into the cornmeal mixture; toss it about so it’s coated on all sides and place it on the lined baking sheet. Do it with the next oyster, and the next…. In a deep pot heat at least 2 inches of oil until it registers 375 on a thermometer. Pick up an oyster, shake it to remove excess breading and plunk it into the oil. Fry for about a minute and a half until just golden, then remove with a slotted spoon and set on paper towels to drain. 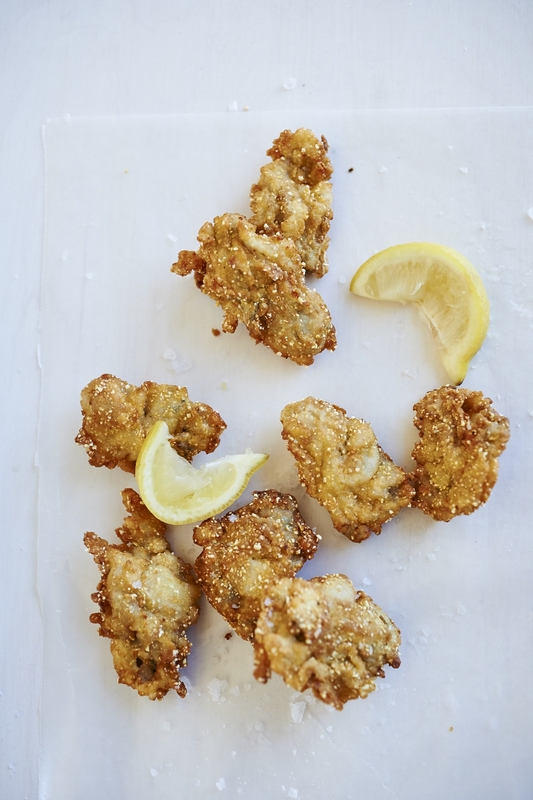 You should be able to fry 6 to 8 oysters at a time. Bring oil back to 375 before adding a new batch. Sprinkle with salt and serve with plenty of fresh lemons. Some people like tartar sauce or remoulade with their oysters, but I think that masks the delicate flavor. You know how sad clementines can be when you bring them home? You’re looking for something juicy, bright, fresh – but they’re just kind of hard and miserable? Contemplating an entire bag of the things, it hit me that I should try roasting them. All fruits and vegetables get better when they’re blasted with heat. So I peeled the clementines, separated them into sections and took off as much of the white strings as I could. I slicked a cast iron pan with olive oil, cranked up the heat and roasted the sections for a couple minutes a side until they were slightly charred. But then what? It wasn’t quite enough. So I heated a bit of olive oil, tossed in some red pepper flakes and a few sprigs of the rosemary plant that lives in my kitchen. I added a couple drops of cider syrup (anything sweet would do), and a splash of vinegar, and let that sit on the stove for a few minutes. Then I poured it over the tangerine slices and let them marinate all day. I served them, sprinkled with salt and a few grindings of kampot pepper, on crackers spread with ricotta. They’re also great with sliced prosciutto. 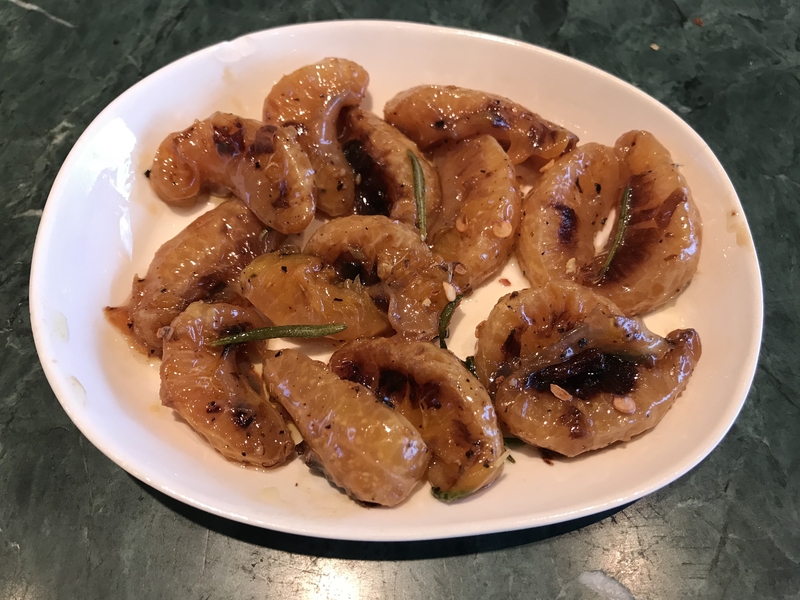 But I can think of lots of other ways to use these little bites of citrus. Think of them kind of like marmalade in the rough- and let your imagination run wild. I made James Beard’s “onion rings” the other night for the first time in a while. Now’s the perfect moment for them – farmers’ markets are filled with sweet onions just pulled from the earth, and this is the best way I know to showcase that compelling flavor. On top of that, this is the moment when all the parsley in the garden is proud and full. 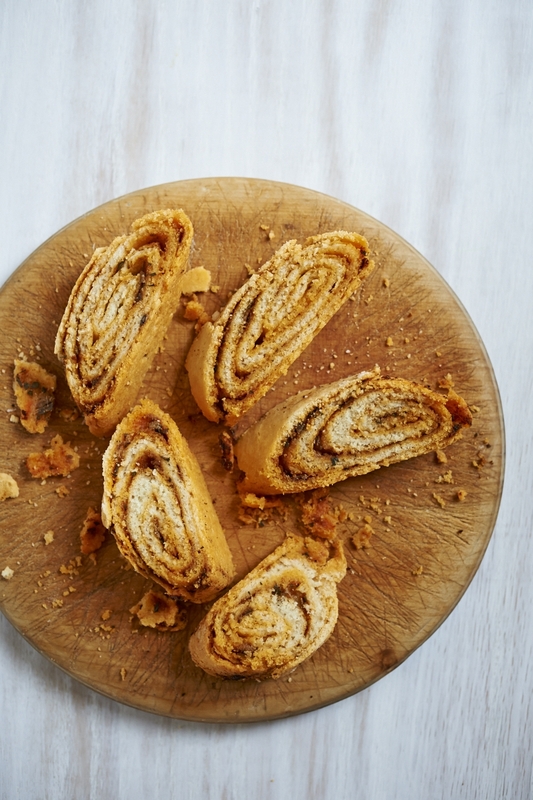 Start with a loaf of sturdy white bread. Or traditional Pepperidge Farm sandwich white. Using a 2 1/2 inch cookie cutter, cut circles out of the bread. Slather them with good commercial mayonnaise and sprinkle them with salt. Slice your onions very thinly. Chop a good amount of parsley as finely as you like. Put a slice of onion on a circle of bread and sandwich it with another circle of bread. 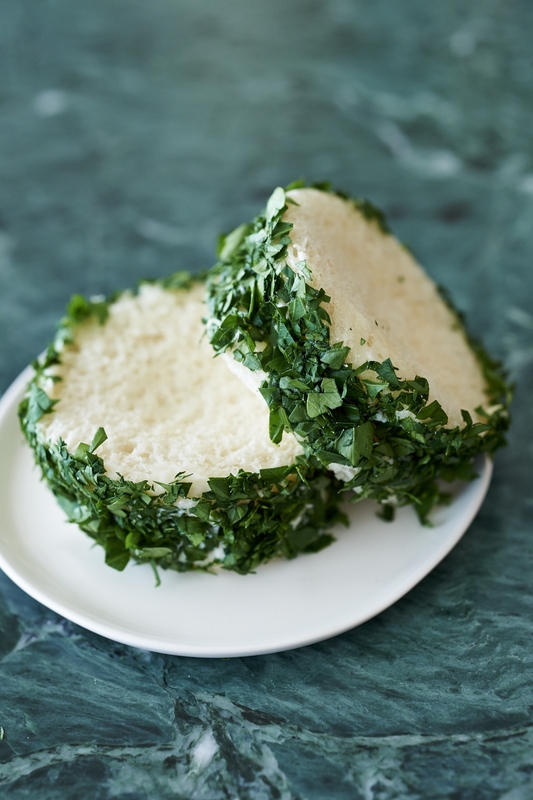 Spread mayonnaise on the edge of each sandwich and roll it in chopped parsley. These keep surprisingly well; I just ate the last of the two-day old sandwiches. It made a perfect 10 a.m. snack. At the Great Barrington farmers market the other day, I stopped to talk to the people from Mayflower Farm. Then I noticed they had lamb riblets for sale, and I was intrigued. I’ve been seeing them on menus quite a lot lately (probably because they’re an inexpensive cut), so I thought I’d take a chance. But what to do with them? I decided, for a first outing, to try an Asian-inspired recipe. The results were so delicious I wished I’d made twice as many; we devoured them in a matter of seconds. Mix 2 tablespoons of coconut or brown sugar with 2 tablespoons of fish sauce, 2 tablespoons of soy sauce and a tablespoon of neutral vegetable oil. 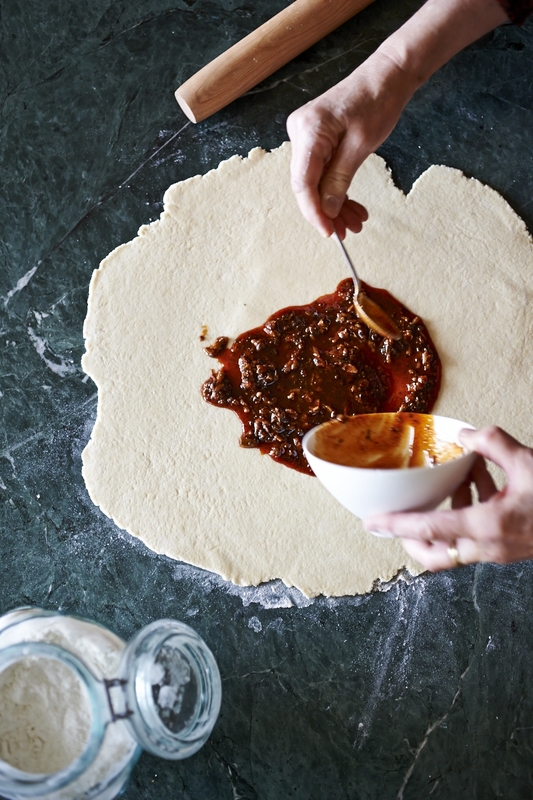 Stir in a tablespoon of Gochujang or Sriracha (any kind of hot Chile sauce will do). Add the juice of half a lime, some freshly grated ginger, and a couple of teaspoons of ground coriander seed. Mince a clove of garlic and a couple of small shallots, and add those as well. Preheat the oven to 300 degrees and line a baking sheet with foil. Put the ribs, well separated, onto the baking sheet and roast them for an hour and a half, until most of the fat has cooked away. Baste with leftover marinade every half hour or so. 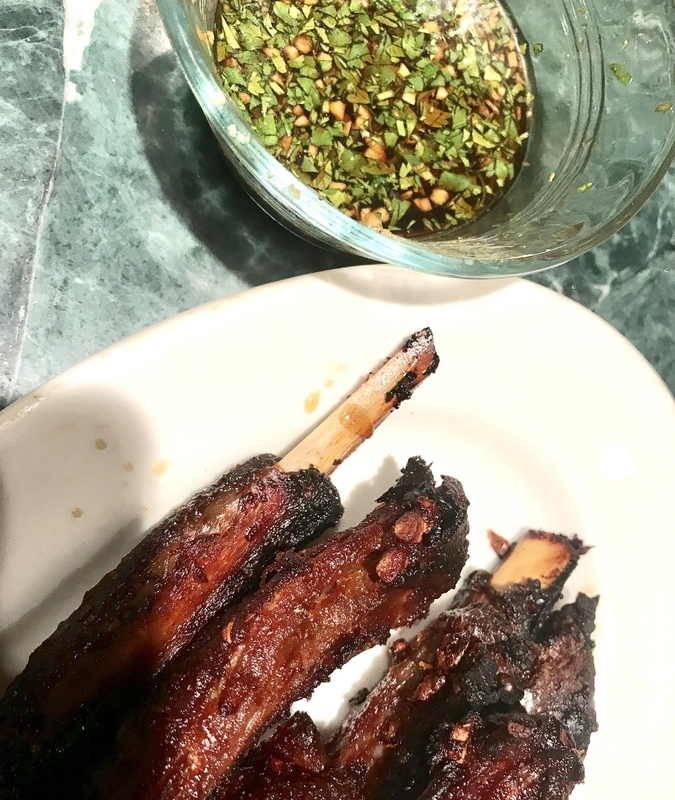 Remove from the oven, crank the heat up to broil and broil the ribs, 6 inches from the heat, for a minute on each side, until they’re lightly charred. Serve with this dipping sauce. Mix a tablespoon each of fish sauce, lime juice and rice vinegar with 2 teaspoons of sugar. Add a couple teaspoons of soy sauce, and a small clove of minced garlic. Add a tablespoon or so of chopped cilantro. This makes an irresistible appetizer for four people. 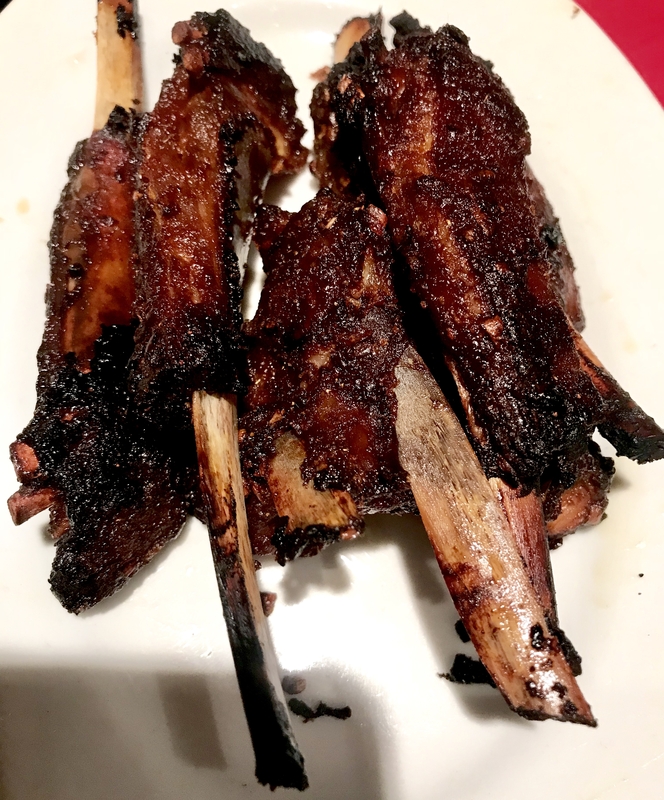 I suspect that lamb riblets – so inexpensive at the moment – will catch on and the price will soar. So get them now while you can still afford them.